Batman v Superman: Dawn of Justice (2016) – Movie Review – Another Movie Blog! For all the conversations that happened after Man of Steel on whether this version of Superman killing Zod would make him learn from his actions, Zack Snyder and Warner Bros pretty much made all those conversations a moot point. They listened to that outcry, and made Batman V Superman: Dawn of Justice the most expensive reaction to that response they possibly could. But not by backpedalling. Indeed, it instead does that by doubling down on those aspects of his Superman, and indeed all of these characters. The first Superman scene sees him kill a terrorist (at least I won’t buy that this person didn’t die). Batman’s best action scene sees him gun down an entire mob, and brands people so they are killed in prison. In terms of changing the characters from their original comics source this even more of a revisionist tale of superheroes than Snyder’s own Watchmen. Even Frank Miller Batman in The Dark Knight Returns didn’t really kill. There is no concrete explanation as to why the moral quandary of Batman (“should I kill?”) is gone in favour of guns, and the very pointed “it’s not 1938 anymore” to Superman (the date of publication for the first Superman comic) adds to my belief that he just doesn’t like this character. The sheer dourness of the proceedings doesn’t really change throughout its entire runtime. Some people tend to call anything that happens to have a dark tone “nihilist”, but with conversations about the death of gods this legitimately meets that criteria (with Lex Luthor going on and on about those ideas). And honestly, more than Man of Steel for the first hour I was interested to see where this change would go. Over 80 years of their creation these characters have changed a lot, and have had their ideologies changed along with it. I was done fighting the movie on what I wanted these characters to be, and was interested to see where this movie was taking them. It maybe helped that Ben Affleck’s Batman is in contention for the best onscreen presentation of the character from looks to attitude to combat that there’s ever been. The back and forth between him and Jeremy Iron’s Alfred has genuine chemistry, and even the more enjoyably silly moments (like a Rocky like training montage with a tyre) came from his arc. The movie was maybe too ponderous and pretentious for its own sake, and traded on the ugly fears of our society in this point in time. But unlike a lot of superhero movies, even ones I like, it had stakes and questions. “Do we need a Superman?” is a question that could have filled an entire movie. I was not liking the answers the movie seemed to be giving, but I was on board with it regardless. And then that all exploded along with a jar of piss. Lex Luthor’s piss. With that everything I was willing to disengage from came back into focus. At the very least it made me think everything I was reading into this movie was an accident, because everything the movie was concrete about was either convoluted or idiotic. 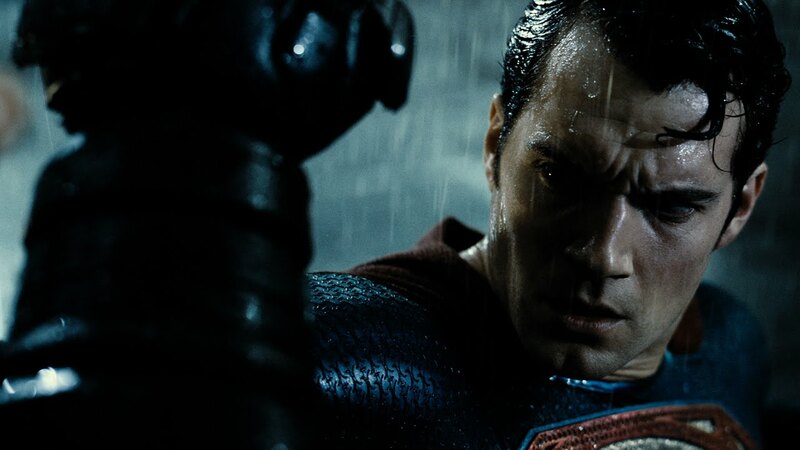 The ten minute fight – yes, one fight, in a movie called Batman V Superman, is ten minutes in a two and a half hour movie – could not have been set up in a more overcomplicated way, and the way it ends aims for pathos but is genuinely laughable. I want to say this is a problem of the studio, but considering the thing that makes it stop is the first uttered line of the movie, it is entirely on Snyder, Goyer and Terrio’s terrible script. Considering they have had three years to work on this movie, it is shocking how much this movie doesn’t make sense, to the extent that you would think they were trying to the most confusing version of characters originally designed for children that they could. At one point I thought the editing and the fact the plots don’t flow into each other was meant to be impressionistic, but after a while it was just clear that it was all over the place. There are at least five different movies in here, and not one of them is given enough time to be truly effective, no matter how hard the direction tries to make them so. Whatever else you can say about Zack Snyder, but he may one of the greatest aesthetic directors working today. Indeed, I don’t think I’ve ever seen a director whose strengths of overblown style so clashes with the ponderous material he actually wants to make. But this is the least visually interesting movie he has ever made. The genuine moments of awe give way to dark actions scenes that honestly aren’t too far removed from the Christopher Nolan movies, and the end result is drabness with garish scenes in between. The terribleness of the events is also orchestrated by Jesse Eisenberg’s Lex Luthor, who is a walking tonal whiplash. He is even more of a cartoon than Gene Hackman’s version in the original Superman movie, and his reasons for wanting the fight to happen is the most complicated and non-existent explanation I have seen since that last Fantastic Four movie. First it seems to be “just ’cause”. Then he has daddy issues. Then hang ups about God. Then he wants to build a giant monster. I don’t even know what his job actually was. If you told me that this character was originally written as the Joker, I would believe you. I have to admit though, with his weird quirks and campy inflections, I was liking the movie he was in. But not him in this movie. I haven’t even got to to the other half of this Batman and Superman combo yet. Which is probably because this is not a Man of Steel sequel but a Batman movie with a Superman arc in it. As Warner Bros can only seem to do Batman, he gets the short end of the stick. Which is an honest shame, because the conflict between Superman and a world terrified of him is one I am genuinely interested in. His relationship with Lois Lane has also been at the heart of so many of his best stories. And this movie seems to respond to that by placing Amy Adams in situations that her character has no business being. Her presence in the final scenes only seems to be an attempt to act gravitas to an admittedly ballsy choice of a finale. Whose final shot immediate cops out, rendering that ballsy-ness castrated. Wonder Woman was also in the movie. I don’t know if anyone can actually critique anything about her because she has so little presence in the movie. As an adaptation of the character, at least she is the warrior princess with agency we all know and not any kind of damsel. But apart from that Gal Gadot’s acts as just a kind of exotic temptress, her lines moving from smiling to stiff at a whim, and her reveal at the final fight just sort of happens. Speaking of which, Doomsday looks like a cavetroll from Lord of the Rings with the CGI also looking from 2001. His presence in the movie is so rushed that when it leads to an boring, incomprehensible action final action sequence, I realised just how little I cared about the fact that three of the greatest comic book characters were on a screen fighting together. But the movie promises more. Rather than an end credits sequence, the movie’s Justice League world-building is forced into the movie through (enjoyably nuts) dream sequences and a scene that honestly shocked me in how unsubtle and cynical its execution was. That was meant to make me excited for this media empire Warner Bros has built to contrast with Marvel. But if anything it made me care less. Even the things that intrigued me about Batman V Superman: Dawn of Justice make me realise that this world just isn’t for me (unless Suicide Squad changes my mind). Batman V Superman: Dawn of Justice is maybe the most genuinely ugly at heart blockbuster I’ve seen in quite some time. So, quite honestly, if superhero and action movies reflect the times and values they were made, this is more than fitting for the world we live in at this period of time. To paraphrase a better Batman movie, this is not the movie we needed, but it is the one we deserve.